The wood-effect finish of this attractive printed Bluetooth 4.1 speaker (2 x 3W) might look fantastic, but it also produces a fantastic sound. It comes with a built-in amplifier and a rechargeable 400mAh lithium-ion battery, and the user can charge it up easily with the included USB cable. It would make an excellent promotional item for your brand no matter how you choose to use it. Clients and customers will love it, and it could be especially suited to your company if you operate in the tech or music sectors. Print this product on the top (other positions may also be possible). Our speaker items are printed in up to 8 colours via doming print, which is a perfect technique for logos or artwork with gradients or complex colour schemes. 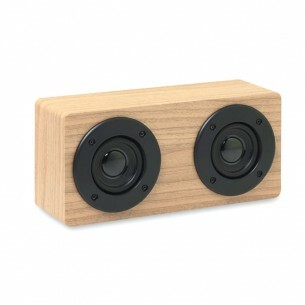 Our bluetooth speaker 2x3w 400 mahs are made from mixed and comes in wood.